You are here: Home / Overland Track / Overland Track Walk Guide – we would have given him one! It is pouring down rain in Victoria this morning and very wet across southern Australia. 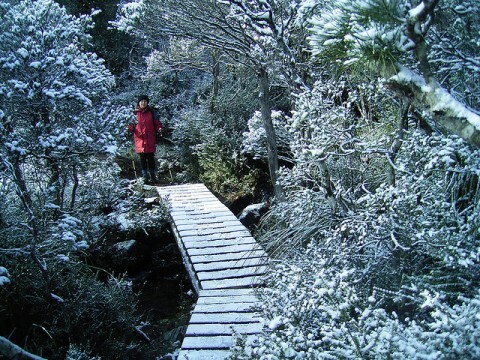 One person who has been watching the weather closely in Tasmania for the last week is fellow Our Hiking Blogger, Sue. 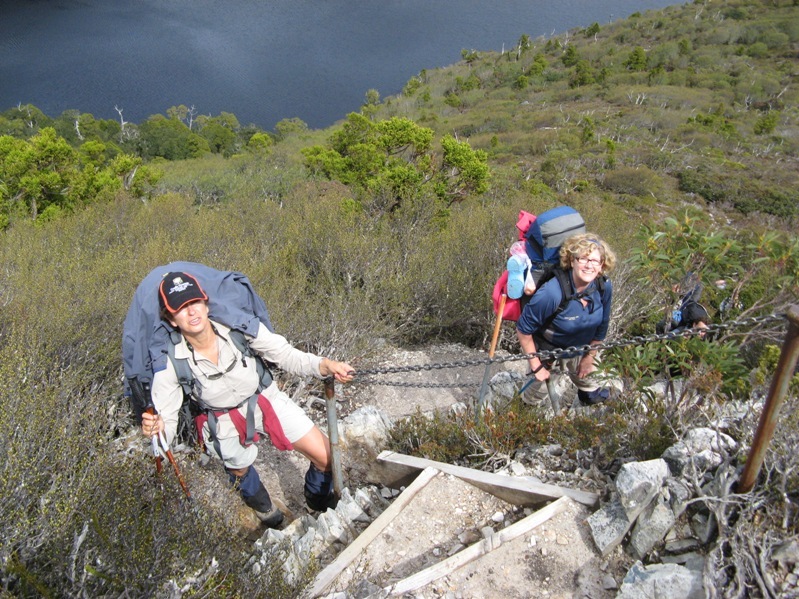 On Thursday, Sue and three friends head off to Tasmania to hike the Overland Track. This will be her 8th time walking from Cradle Mountain to Lake St Clair. They are well prepared for this trip, no matter what the weather or conditions. 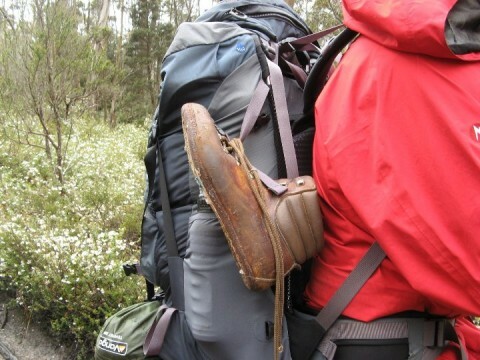 By drawing on her experience and using the information in our How to hike the Overland Track guidebook she has the right gear for the Overland Track and Tasmanian walking conditions. This article is not an advertisement for the Overland Track Guide, rather a few points outlining why it is useful for first time walkers on the Track. Recently on Trip Advisor, McGalio write up his Overland Track experience. It made interesting reading and reinforced our initial reasons for writing the guide. We had a pretty good time, but we were unprepared. Physically we were ready to go, but our equipment (especially shoes) were not up to the task. So, there were some hard times. We were naive, but the official website is misleading. This is a hard hike. You need to be able to tromp through long stretched of mud. The website would lead you to believe that there is a lot of boardwalk. This isn’t the case. Even when there is boardwalk, it’s in disrepair to the point that you’d rather it wasn’t there. The huts/camp sites were very nice though. The surroundings are breathtaking. Just make sure you’re prepared before you go, or it may be lost on you. Also, take your time. We did it in 3 1/2 days. I wish we took 5 or 6. 12 hour hiking days can be hard to enjoy. Also, some sites say its a 65 km track. This is “how the crow flies.” It’s actually around 85 km. Make sure your shoes are waterproof and bring gaiters!!! Don’t cheap out on equipment. It will make it a completely miserable experience if you’re unprepared. I feel lucky that it was just our shoes that weren’t up to the task. I can’t imagine having a wet sleeping bag or an uncomfortable pack. Have fun. It can be great. But you have to make it that way. It can also be terrible if you don’t respect it. Great advice from this young fella! So what is Sue’s plan with her three friends later in the week? They are just taking their time, wandering from hut to hut, stopping and enjoying the scenery and native animals, eating well, keeping dry using good gear and allowing six nights for the trip. A nice way to enjoy yourself and have a very relaxing journey. If you are planning the Overland Track and want more information about our ebook, How to hike the Overland Track click on the link. There are also a lot of testimonials from people who bought and used the guide that may reassure you. For those of you who already own the book, expect an email early next week with your free copy of the new, updated edition. Editing is almost complete and the book ready to release. It has had a major design overhaul, lots of editing and tidying up with a few additional sections. Many thanks in advance to Georgie Bull for all her hard yakka trying to make it more like the “Queen’s English” and getting rid of a lot of brackets etc…. Looking back, what would you have done differently? Shoot us a comment below, you know we love to share your thoughts! Geday back Steve – she will have a great trip. Has just been shopping at Mountain Designs and arrived home with some new stuff. Thermals and a hat! Great salesperson there called Fiona! McGalio’s comments are spot on. I walked the track with my wife and two sons (8 & 12yo) last October. We walked between 1 hut per day, which as it turns out was plenty for our party. This also meant arriving at the huts in the early afternoon which allowed time to relax with the other campers while it was light. We bought a lot of expensive gear e.g. pack, sleeping bags and mats and they paid for themselves over again. It snowed during the trip but we were generally comfortable. I should have bought some new boots, the old ones were up to the task but stayed wet the whole trip, as did the boys (hard to find good boots that small) although the socks we invested in kept our feet warm despite being wet. All in all because of our gear and the long time frame, we enjoyed it. Yes, being unprepared, getting halfway and being miserable makes for a long, long walk home. Preparation and good gear is the key. Thanks for reinforcing it! I walked it with my 11yo son in March. This was our first walk and we used Frank and Sue’s book to plan every facet of our trip. We took our time and met some great people along the way. The only thing I would do differently is reduce my pack weight. My son’s pack was fine at 9-10kg (his weight was 42kg). My pack, however, was way too heavy – I took too much food and a number of items I didn’t really need. At the start of the walk I estimate it’s weight at 30-32kg (I weigh 90kg)and the first 2 days hurt. But did you follow our packing list??? Please say no, we don’t want to be blamed for you carrying 30-32kg. Thanks Steve, I meant to say that too. Our middle daughter Hannah is the only one of the family who has not walked the OT. She facebooked me today and wants to do it this year! Whoot. Now I have an excuse to go. My partner & I walked the OT in October 2009. We walked from Lake St Clair to Cradle. It was great walking south to north. You had beautiful views of the mountains dusted in snow everyday. The only thing I would bring extra is a small candle for use in the huts while sitting around talking at night. For a few grams it will save my head torch batteries. Frank, might see you on the track! As you know we are starting off in the Walls & heading to the OT via Dixon’s, Lake Meston, Lake Myrtle, Lees Paddock to Pelion & out via Scott Kilvett Hut. Really looking forward to it. Thanks Frank for sharing all the information on the Overland Track! I now live in Seattle, Washington but lived in Burnie, Tasmania for about 6 months back in 1998. While there, I took several trips up to Cradle Mountain and the OT is definitely on my short list of things to do before I die. Tasmania is such a rugged landscape…one of the truly wild places left in the world, for sure! I really enjoyed reading through your blog and will be sure to visit often as I hope to get back to Australia sometime in the next couple of years to do some of the more iconic trails. Out of curiosity, what’s the easiest way for someone in the states to get a hold of your guide for the OT? Lol, you lived in Tassie! What were you up to there? 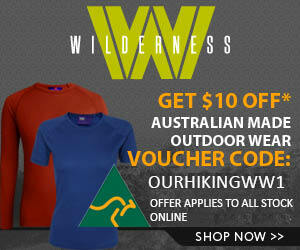 Best way to grab the Overland Track guide is via this site. Just click on the menu thingy above where it says Overland Track. It will take you to a cleverly crafted, pushy sales page where you click on a big orange button…. I am at the airport in Melbourne as I write this bout to board a flight to Hobart. Sue has just finished the Overland today and we are meeting up to spend some of Easter at Bruny island. She tells me she met a family we helped out via the site so that was pretty cool! She also tells me she has some interesting tales for here so that should be fun! I was there as a part of a study abroad program. Spent most of my time in Melbourne but had a sixth month run in Burnie. Had an absolute blast and hope to get back to do some more exploring. Just downloaded the guide and am looking forward reading through it. Hope you had a safe flight down to Hobart and that Sue’s trip was a good one. Definitely looking forward to reading about her experiences. I’m actually in the process of preparing for an 18 mile (29K) hike (walk) up Lake Chelan here in the North Cascade Mountains of Washington State. Should have some new stories of my own soon…can hardly wait! We are the family that met Sue on the last day of our Overland Track travelling with 4 teenagers. What a fabulous experience. We are having withdrawals being back in the land of the living. The kids have been camping from an early age and have done a couple of overnight walks but nothing like the OT. We completed it the first week of our holidays then travelled from Hobart up the east coast of Tassie the second week. I have asked all the children the same question – What week did you prefer? Without any hesitation, they all preferred the first week walking. Interesting!! No mobile phones, not technology. It took me 12 months to organise our trip as we had to kit everyone up, I brought a dehydrator and did our meals and with a great deal of information and suggestions from your Hiking Blog and the most magnificent weather you could ever be lucky enough to get, the hike went without a hitch. Our middle child who is lovely but a bit of a princess (apprentice hairdresser), as Sue probably mention, did have a few melt downs at times but also kept on saying how beautiful the scenery was. I could not believe that we met up with Sue on our last day, after reading your blog and you said that Sue was doing the walk, it did run through my head that it would be fantastic if we met up with her. We had a great last night together with Sue, Deb, Anne & Mark. If you are ever up in Sydney it would be great to catch up for dinner. Anyway had better stop rambling as it is Jaye 50th today and all the family are coming for dinner, but just wanted to make contact, thank you for your text (hope you enjoyed Bruny Island) and to say to anyone thinking of doing the OT – get a copy of your book and go for it – one of the best experiences ever. Thanks so much for dropping by and leaving a comment! Sue was rapt to meet you guys on the Track. She said you were all a lot of fun. Really glad the walk was the highlight of the trip. You were all so lucky with the weather, it sounded like a magnificent week. She loved meeting the “princess” too, really pleased that she enjoyed the scenery. Tell her the next time is much better and mentally easier. We had a few “moments” the first time Sue did it. The next time was magic, she knew what to expect and had an absolute ball! Thanks very much for your book recommendation, very pleased it was helpful. Now you have all your gear keep it up! Bushwalking is a fantastic adventure. Have just got back from the Overland Track, did it over 8 nights 13-21 January. Rally glad we changed our original starting date. The week before it was miserable weather, snowed on Cradle Mountain 2days before we started and we found a little patch of snow up there under some rocks. Stayed 2 nights at Pelion. I highly recommend this as the walk in is really hard ( and 17km not 14km like the Chapman book says). And there are tons of side trips to do ( we did MtOakleigh which was my favourite climb) and a great swimming hole that was even WARM. I mean, you could actually swim around in it instead of jumping in, going into a state of shock and then trying to clean dirt off while you slowly go numb! We stopped at Bert Nicholls hut for lunch and went on to Kia Ora, to give us time to get to Pine Valley. Climbed to the Acropolis which is incredible, passed some crazy people lugging full packs up there to camp! Walked out to Narcissus late instead of spending the planned 2nd night at Pine Valley. Then walked out around the lake to Cynthia Bay. Everyone else piked out and took the ferry saying that the walk was boring. Well my feet were in agony, but how anyone could say that walk is boring is beyond me. It has the biggest trees on the whole track and some great rainforest with a real Jurassic Park feel to it. And we had an amazing swim in the lake at Echo Point, a really sunny day about 25 degrees. We got left behind by the Tassielink bus despite having booked and paid for it. This is at 8pm after pushing ourselves to make the bus and there was no bus out the next day (Saturday). The bus came and went in about 30 seconds without even checking in the cafe for passengers. Apparantly this happens regularly, so BEWARE and get out there early!!! In my defense I was told it left at 8.30 not 8.00 so I thought I was early! Apart from light drizzle and strong cold winds on the first two days the weather was amazing with great views. Most of the time sweating rather than being cold although the first two nights it got down to about 6 degrees. Well this post is getting too long. I would finish by saying the Cygnet Folk Festival is awesome and we loved it (first weekend in January). There are so many summer festivals in Tassie it is easy to combine some festival camping with a trek. I am planning to walk the track again in Easter but take my 3 kids aged 11,13,15 with me and am wondering how cold it could be? We will sleep in the huts and try to travel light. I saw a 7 year old doing the track this time which gives me confidence to take my kids! Anyone got any advice about taking kids on the track or April weather conditions? I am thinking it could be good to not be sweating the whole time, maybe 10-15 degree max temps and 0 degrees overnight? Thanks for your reply! It could almost be a post on its own! Sounds like a typical OT trip. snow rain and sun. Then a good old bus muck up! I is interesting how people help each other out, the trip to Hobart would have been fun. It will be colder at Easter. A few degrees and the chance of snow and rain will increase. If they are geared up and pretty fit and motivated they should be fine. Keep together, especially in bad weather. Really keep an eye out for signs of hypothermia with the kids. They have a tendancy to be ok then crash…. Keep lots of high energy food up to them over the day and make sure you have good warm gear for them to layer up with. Obviously a really good, waterproof jacket is vital! Hopefully others might share their experience. I will also wack your question up on our Facebook page .http://www.facebook.com/OurHikingBlog , there might be some other ideas there. Hope that helps, thanks for your comment and have a fantastic trip! Hahaha! This amused me a lot. I was looking to “wax nostalgic” about the Overland Track and I found this article. I didn’t realize the advice within it would be coming from me. Small world. Great site! Was magnificent great weather and met the best people from overseas they can’t believe what we have in Australia and especially Tassie. Really pleased you enjoyed the OT and you had great weather. Double bonus!